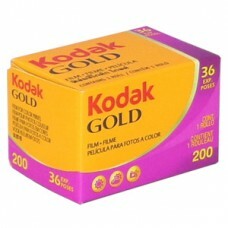 KODAK Gold 200 films are color negative films that offer useful combination of color saturation, color accuracy, and sharpness. Kodak quality at an attractive price. Kodak Gold Bright Sun & Flash 200 Film provides an excellent combination of color saturation, color accuracy, and sharpness in a 200-speed film. Excellent for picture-taking under general lighting conditions. You can also expose this film under photo lamps (3400 K) or tungsten illumination (3200 K) with filters. Kodak Bright Sun & Flash Film features excellent color accuracy and saturation and high sharpness and resolution. It also features wide exposure latitude from two stops underexposure to three stops overexposure.